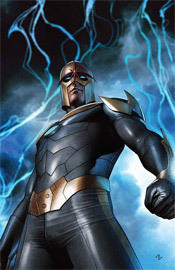 Richard Rider, the current torch-bearer of the Nova Corps, has found himself right in the middle of the Annihilation War, the ongoing conflict between the Kree and the Phalanx. In the midst of fighting the good fight, he found himself infected by the Transmode Virus, rendering him subservient to the Phalanx. But, using the power instilled within him by the Worldmind, he managed to force that virus into remission and escape the warzone. The good news: he’s free of the prison that is Kree space. The bad: he’s been transported to the edge of the known universe, with no clue where to turn next. Dan Abnett and Andy Lanning have been putting Nova through the wringer over the last few issues, maximizing his involvement in the huge Annihilation and taking plenty of risks with the character. This issue is just a continuance of that latter trend – while he’s no longer directly involved with the war, they’ve handled his potentially jarring transition into another tale beautifully. Where the last few issues had focused on the futility of a battle against overwhelming odds, this month’s story shifts that attention to the concept of an outer boundary to our universe and what, exactly, exists there. In the process of expanding on that idea, Abnett and Lanning introduce a compelling suspense / horror storyline in the same vein as Ridley Scott’s Alien. When Nova “washes ashore” aboard a supposedly abandoned living, breathing spacecraft, it’s quickly made evident that nothing is as it seems. No one has ever dared explore that section of the universe, for fear of what they might find, (does everything simply cease to be?) and the pair of writers do everything in their power to heighten the drama and suspense of these first few moments of cautious exploration. Yet they never lose sight of the narrative that had been established in previous issues. When Richard walks into a firefight, he’s reminded that more than 80% of his energy is being used just to contain the Phalanx virus he still carries. Rather than stand his ground against difficult odds at less than a quarter of his usual power, he swallows his pride and runs. It’s a little detail in the grand scheme of things, but it’s just enough to let you know the authors haven’t lost sight of where the character has been. Handling the art chores, Wellington Alves has his ups and downs. When he’s given a giant, important spread, (as he is around the three-quarter mark of this issue) he performs phenomenally. His best work shows hints of Jae Lee, with a tremendous attention to lighting and shadow, but he does display a tendency to lose his focus and mail in his effort on slower-moving pages. Since a lot of this issue is dedicated to a series of conversations inside a giant, soulless spacecraft, those seams in his attention span are probably more evident here than they would be in a more stereotypically action-centered book. At the very least, the abundance of these slower, less visually-stimulating pages serve to further heighten the power of those few giant, important panels scattered throughout the issue. Alves does fine work, but he’s not quite a superstar. Nova is one of the most surprisingly entertaining books Marvel’s producing at the moment. Although the last page left me a bit concerned about the direction it’s heading, I’ll give this writing team the benefit of the doubt for the moment because they’ve already delivered so much with a character I didn’t always have the time of day for. If strong adventure, science fiction and horror are your thing, you’re going to want to buy this. Don’t let the word-heavy “previously in” page fool you, despite a few weighty concepts this really isn’t a tough book to read and it never allows itself to get too caught up in terminology and scientific details.